People who have mild cognitive impairment are at an increased risk of going on to develop dementia - although some will remain stable and others may improve. And past work suggests mid-life stress may increase a person's risk of Alzheimer's disease. A Swedish study that followed nearly 1,500 women for a period of 35 years found the risk of dementia was about 65% higher in women who reported repeated periods of stress in middle age than in those who did not. Scottish scientists, who have done studies in animals, believe the link may be down to hormones the body releases in response to stress which interfere with brain function. 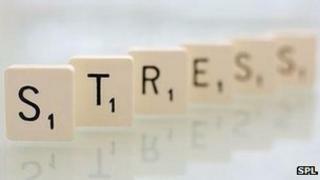 Prof Clive Holmes, from the University of Southampton, who will lead the study, said: "All of us go through stressful events. We are looking to understand how these may become a risk factor for the development of Alzheimer's. "Something such as bereavement or a traumatic experience - possibly even moving home - are also potential factors. "This is the first stage in developing ways in which to intervene with psychological or drug-based treatments to fight the disease. "We are looking at two aspects of stress relief - physical and psychological - and the body's response to that experience." Dr Simon Ridley, of Alzheimer's Research UK, said: "We welcome any research that could shed new light on Alzheimer's disease and other causes of dementia. "Understanding the risk factors for Alzheimer's could provide one piece of the puzzle we need to take us closer to a treatment that could stop the disease in its tracks."